Newberg resident are busily stuffing shoeboxes in preparation for the annual Operation Christmas Child project. 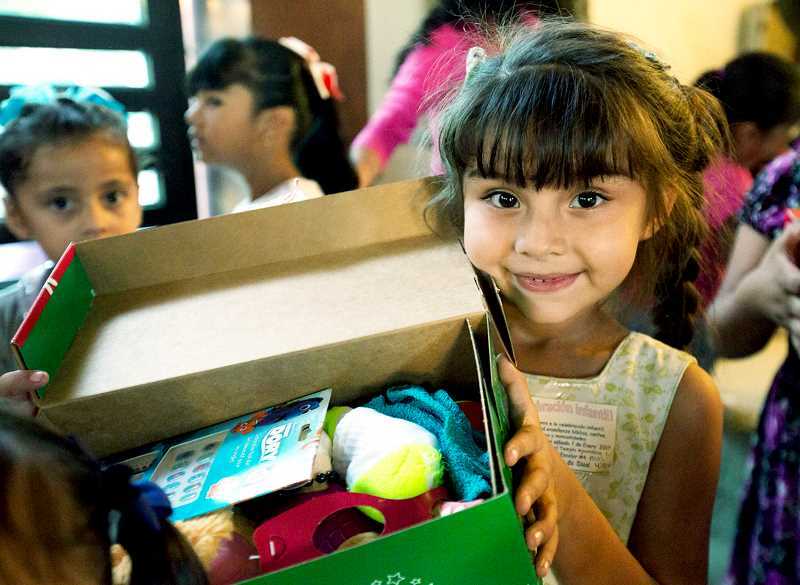 Families, churches and groups will deliver their stuffed shoeboxes at drop-off sites during Operation Christmas Child's National Collection Week, Nov. 12-19. The project, part of Samaritan's Purse, began back in 1993 and has since collected more than 28,000 shoeboxes locally. The international relief organization has started several projects that involve volunteering and giving, Operation Christmas Child being one of them. The process is simple: volunteers fill a shoebox with gifts for children around the world affected by poverty, war or natural disasters. Toys, school supplies and hygiene items are among the items allowed. From there, participants deliver their shoeboxes to a nearby drop-off site. This year, Grace Baptist Church on East Second Street will act as the designated site for the Newberg area. The shoeboxes are then sent to one of the six-regional processing centers where they are inspected and officially sent to far-off lands. The gifts are shipped from the centers by mid-December, reaching many children by Christmas. Some, however, are delayed due to international shipping issues. Either way, the effort to deliver the gifts to children is made throughout the world. Paul Jellum, Newberg's drop-off team leader, said Newberg alone collected 1,344 shoeboxes last year. That is a significant increase from 2016, when 992 boxes were gathered. Jellum coordinates the drop-off site and helps collect shoeboxes and take inventory. He has been involved in Operation Christmas Child for eight years and just recently became Newberg's designated drop-off leader. He and his family still fill hundreds of shoeboxes in hopes that children will be greatly impacted. "It shares the greatest gift to the world which is the good news of Jesus Christ," Jellum said in an e-mail interview. "What could be better than blessing children and sharing Jesus?" Samaritan's Purse began this effort as a way to share the gospel with children across the world. While volunteers pray for the recipients, the children receiving the gifts are also invited to participate in a 12-lesson discipleship course called "The Greatest Journey," which includes Bible stories and scripture memorization. More than 14.9 million children have been enrolled in the course since 2009. After completion of the course, the children are given a graduation celebration where they receive a certificate and their own Bible. Since 2009, more than 6.9 million children reporting on following Christ. "One of our core values is to never be manipulative," the organization's website says. "At the same time, we do seek to share the gospel wherever we go, which can be challenging at times." The project's primary goal is to spread love and the word of Jesus, but some regions do not allow literature distribution. This doesn't stop Operation Christmas Child from giving as shoeboxes are delivered, nonetheless. "I came to recognize that this simple shoebox was an amazing opportunity to demonstrate the love of God to children around the world," Jellum said.